Rabbit anti Human Neuregulin 1. E.coli derived Recombinant Human HeregulinÎ²-1. Produced from sera of rabbits immunized with highly pure recombint Human Heregulin-beta1. 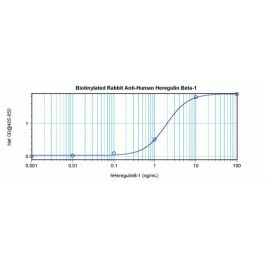 Anti-Human Heregulin-beta1 specific antibody was purified by affinity chromatography and then biotinylated.